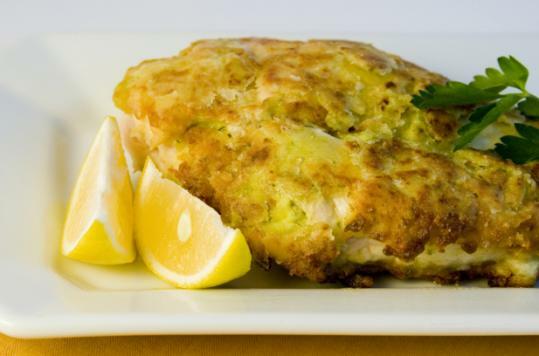 With a layer of savory Dijon mustard, these boneless chicken cutlets are crisp on the outside and bursting with flavor. The mustard is mixed with onion, flat-leaf parsley, and olive oil into a paste that you press onto skinless, boneless breasts. You can also use other fresh herbs, such as tarragon or thyme, to flavor the cutlet. Pat the chicken dry before dredging with flour (the flour adheres better) and pan-fry the pieces in olive oil until they’re golden. Accompany the cutlets with steamed broccolini or slice the chicken and serve it on romaine leaves drizzled lightly with a white wine vinaigrette. 1. In a food processor, combine onion, parsley, mustard and 1/4 cup of the olive oil. Work the mixture into a thick, smooth paste; do not let it get too thin. 2. On large plate, place enough flour to cover the bottom of the plate generously. Add salt and pepper. Dredge each chicken piece with flour, gently shaking off the excess flour. Set them on a clean plate. Rub the mustard mixture over chicken. Dredge again in flour. 3. In large skillet that will hold all the breasts, heat the remaining 1/4 cup olive oil over medium heat. Fry the chicken for 6 minutes on each side or until golden brown and cooked through. Garnish with lemon wedges.